It’s finally fall, and a chance to snuggle under sweaters and pajamas. We want to keep our cats safe and warm. What if your cat does get out? What is the best way to draw him back or help him find his home? Place his letterbox outside near the door you think he used. The smells of the box are powerful and will draw your cat home. Place a little food in his bowl on the porch – but watch it, as there may be other animals who smell it as well. Call his or her name out loudly in the tone you normally use. Place a dirty t-shirt or pillowcase in your yard, in the hope that our smells will get to your cat. Post signs, and check with all the local vets. On Facebook recently we heard about Peepers, who slipped out behind her cat-mom last week. She was gone for nearly 5 days. The people who found her, scruffy and a bit beat up, scanned her for a chip. Peepers was chipped as a kitten, and sure enough, the scan found the chip. Reading from the chip information, the vet found the phone number and called Peepers mom and Peepers is back home safe. Please. Don’t. Wait. Get your cat or kitten microchipped today. The cost is minimal, and the benefit profound. The CFA is holding its International Cat Show on November 18 and 19. Planet Devon will be there. Will you? Special Planet Devon art and gift pricing for the show! 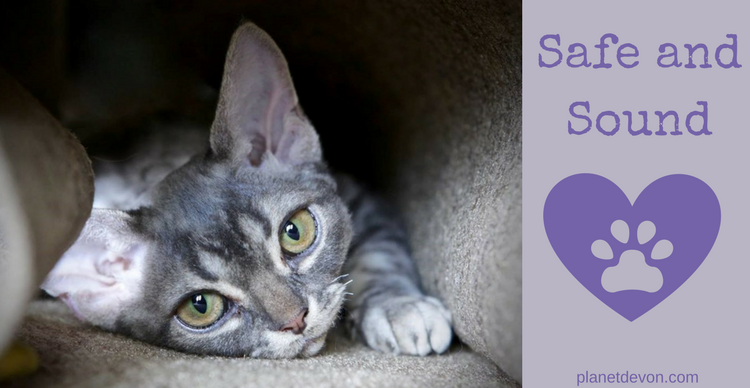 Planet Devon is committed to supporting the owners and breeders of the Devon Rex. Planet Devon can help you find the Devon Rex kitten or retired Devon Rex of your dreams from ethical and responsible breeders.